Where Can I Find My Customer ID and Account Number? 1. The “Thank You” and “Purchase” emails you received from Lightspeed Systems upon purchasing software, hardware, or licenses contain your Customer ID and Account number. 2. In the Web Filter under Web Filter > Settings > About > Licensing (below Software). 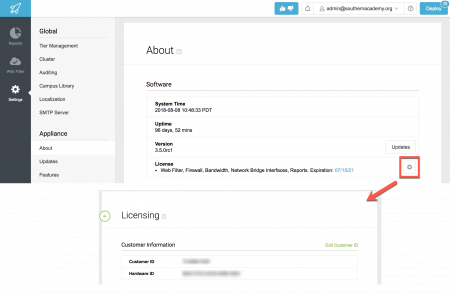 Click the gear icon to open the License page. 3. You can always ask your Account Representative. 4. You can always email support@lightspeedsystems.com.